Since arriving in Portland last summer with his baker-star wife Kim Boyce and an impressive resume from L.A.‘s famed Spago, local food watchers have waiting for Thomas Boyce to make his move. And today, Eat Beat has learned that after fielding offers to open his own place, Boyce has decided to take his talents to Bruce Carey’s Bluehour. It looks like a coup for both sides. Boyce gets a big stage to build a local reputation without financial risk; Bluehour gets a serious talent capable of turning Portland’s sexiest perch into a food destination. Boyce spent nine years as chef de cuisine (“second in command”) in a high-flying Beverly Hills kitchen with celebrity restaurateur Wolfgang Puck, the mastermind behind “California cuisine,” with a range from fine dining to canned soup. L.A. Weekly food critic Jonathan Gold calls Spago “a known training ground for the country’s rising-star chefs…it remains the kind of restaurant that continually surpasses its lofty reputation.” And this from a guy who won the Pulitzer in food writing for his devotion to street food. That’s a good description based on my own Boyce immersion last Sunday at Wild Goose Farm, an intensely artisanal supper club on Sauvie Island and a showcase for off-the-radar talent. Boyce’s menu included an impressive collection of wood-fired pizza; elegant oysters; an eye-popping spring salad, with each vegetable cut to reveal a hidden beauty; breathtaking fresh pasta pinched into beautiful packets; expertly wood-oven roasted salmon with skin as crispy as bacon; and a cheese board accessorized by thoughtfulness, from wood-roasted cherries soaked in port and pinot noir to sweet-and-sour cippolini onions. And this was cooking in a barn, on a three-burner camp store, choreographed by a guy who looked like Nijinsky warming up at the bar. 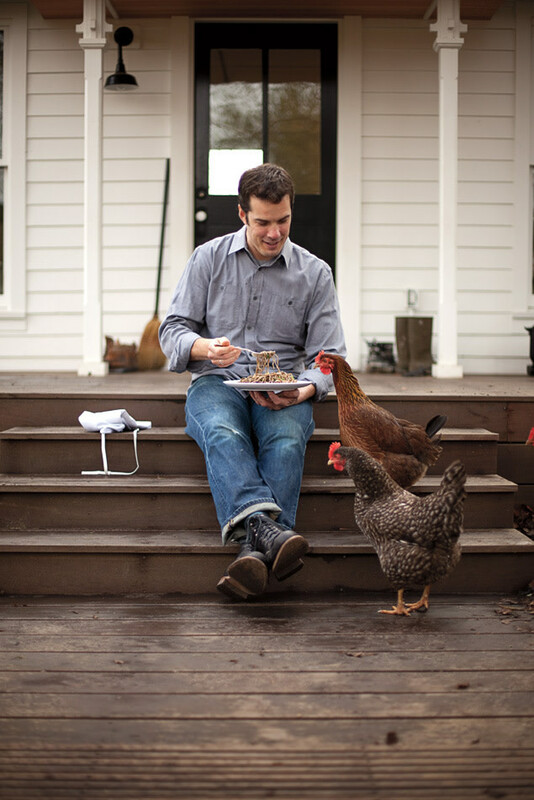 The only question at Wild Goose’s farm-yard table: when can we eat this guy’s food again? Bruce Carey, one of dozens who had also signed up for the communal dinner, called with a surprise answer on Tuesday: starting in August, at Bluehour.